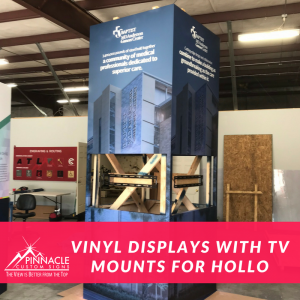 Pinnacle Custom Signs has had the opportunity to meet and work with some of the best in the creative display space industry across the country. Several of our partners produce one of a kind trade-show and exhibit displays that are not like the traditional printed display backdrops that you often see at expos. 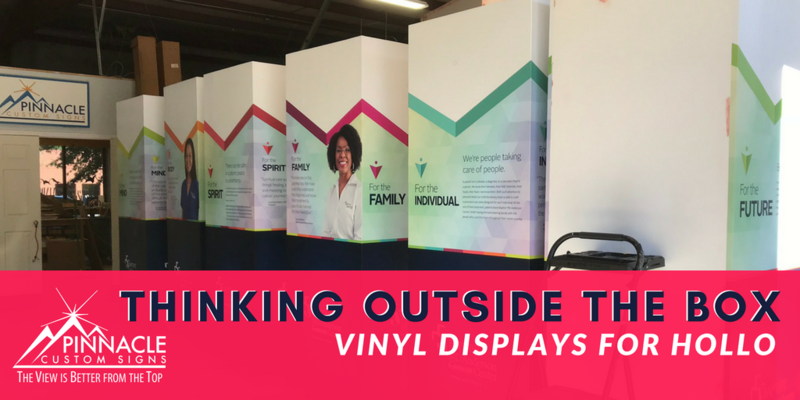 If you think of many of today’s trade show displays, they don’t often use vinyl, because it has to be applied to something such as a frame in order to use the material. Vinyl is also not a traditional material because it is adhesive backed and can’t be “reused”. But in the case of many of our national partners who do one of a kind showings at events, they select a substrate (or frame for mounting) that is reusable and use vinyl to create stunning displays. One of the partners we have the privilege of working with is John at Hollo Productions who often brings us in to assist with some of his projects. Hollo Productions specializes in services for film, television, live experiential events, custom set construction, fabrication & co-ordination, site operations & location services. 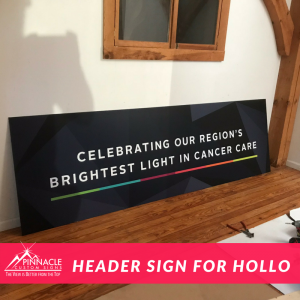 Recently, John reached out to the Pinnacle team to work on some large display pieces for his clients at Baptist MD Anderson Cancer Center. John designed vinyl wraps for large columns that his client want to be used at a Gala/Conference for the opening of the new hospital. The designs included wall graphics for the local train station for people arriving at the Gala. After the conference ends, the columns will be moved to the hospital to be used as a permanent fixture inside the hospital. 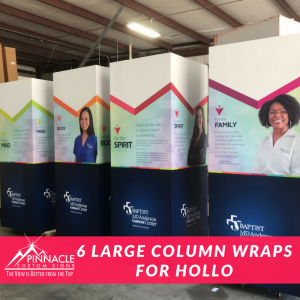 John at Hollo asked Pinnacle to help him complete 6 large column wraps, 4 large columns with TV cutouts, 2 wall wraps, a header sign, and 3D acrylic letter faces to be installed for the Baptist MD Anderson’s event. Hollo provide Pinnacle with the customer built framing for the large columns and the details to create continual graphics that needed line up on all sides for this project. However, the challenge with this project was to ensure graphics of this size would be applied and match up correctly when installed in the offsite location. 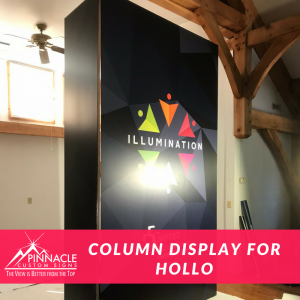 Pinnacle used the customer supplied framing to build out the large columns being used at the event and get it ready for Hollo to transport. The vinyl wall graphics were supplied to the vendor to be installed on site. In some respects, the application was similar to wall graphics that we apply every day. Both these projects used a LOT of vinyl to complete the look. The large column wraps originally designed for this event have been done in a manner that they can be used as a more permanent marketing feature for longer term use. By creating these large displays, John’s client can convey the core ideas of the hospital through branding and sharing the hospitals mission in a more visual way. Using large columns is possible for any business who wants to create an additional visual element for their expo, lobby, or large corporate space. In this example, the columns were used as large messaging boards and as TV displays for the event. Custom built framing allows clients to express their branding in various ways and vinyl graphics can be used to wrap the elements for meeting specific or broad messages. Thinking outside the box is not always the most used concept in branding with vinyl. In some respects, this project is similar to project we help complete for our partner Dimensional Design in 2016. Our client built the structure and utilize Pinnacle Custom Signs exceptional print and application capabilities in the vinyl space. Both of these companies focus on big structures to get their customers noticed. At Pinnacle, almost any display can be created that you can dream up with the right budget. Pinnacle works with numerous vendors who can custom build out framing to create backdrops and interior displays that can make your business stand out in the most unique ways. If you have a vision for your business that is bigger than usual, give us a call. We can work with your company to transform your blank spaces and canvases into messages to your clients and visitors.